The students of one lucky elementary school in Anchorage got a special treat today. Not only did they get a chance to work with service dogs-in-training, but they got to meet their very own United States Senator, Mark Begich. 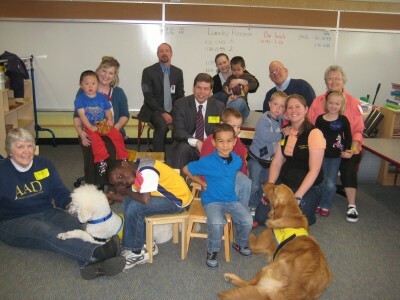 Senator Begich attended a school classroom this afternoon and watched as students from pre-school through 5th grade ran service dogs-in-training through their commands. The therapeutic service dog training offered through Alaska Assistance Dogs promotes positive behavioral models, respect, self-confidence and leadership skills in elementary school students. This month Begich has called for education reform reflecting Alaska’s needs. Thank you for visiting the students, Senator Begich! This entry was posted in AAD News and tagged Alaska Assistance dogs, Senator Begich, Service Dogs. Bookmark the permalink.